Sean and I were met at the mud room door by our Willie. 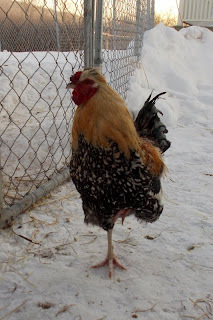 Evidently, he'd spent the night apart from the other chickens because the chicken coop doors were all still tightly closed this morning and he was on the wrong side of them! 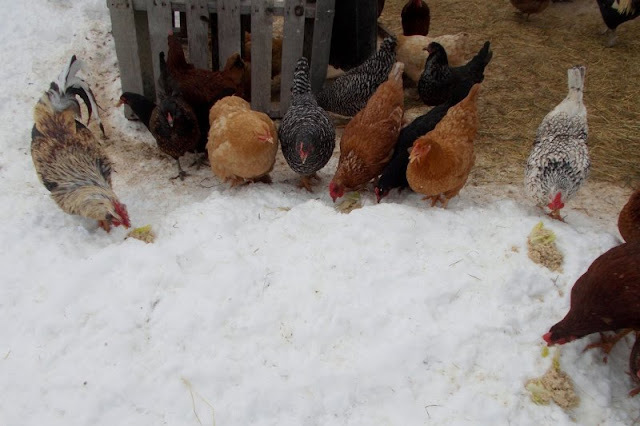 We don't do a head count anymore since we topped 50 chickens; it is just too hard not to lose count at night in the dark, but like most chickens, ours are really good about finding a place to settle in the coop when night comes to the yard. Apparently, Willie escaped during the day some time and when it started to get dark, decided to just settle in where he was. He was quite pleased to see us. 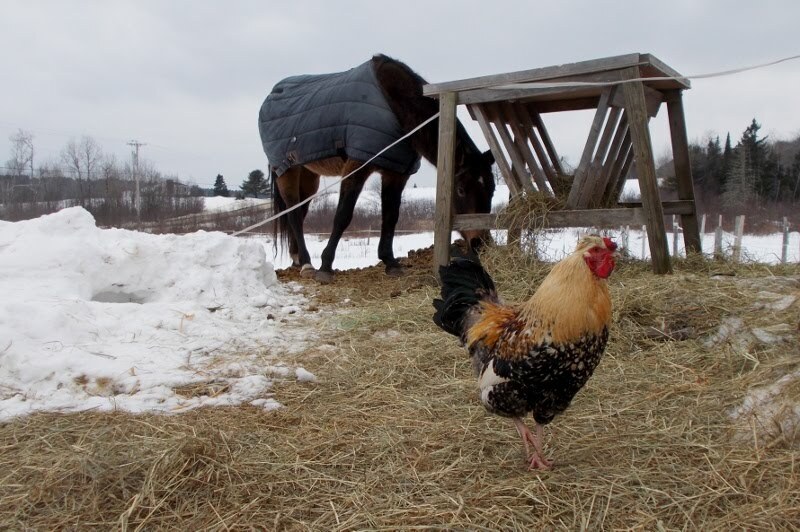 Next, Willie joined me in feeding Jasmine and the goats their morning hay. He took some time to scratch a bit in the loose hay on the ground, while I muscled the hay bales into the mangers. Finally, he escorted me to the chicken coops. Willie waited for me to open the door and returned home. 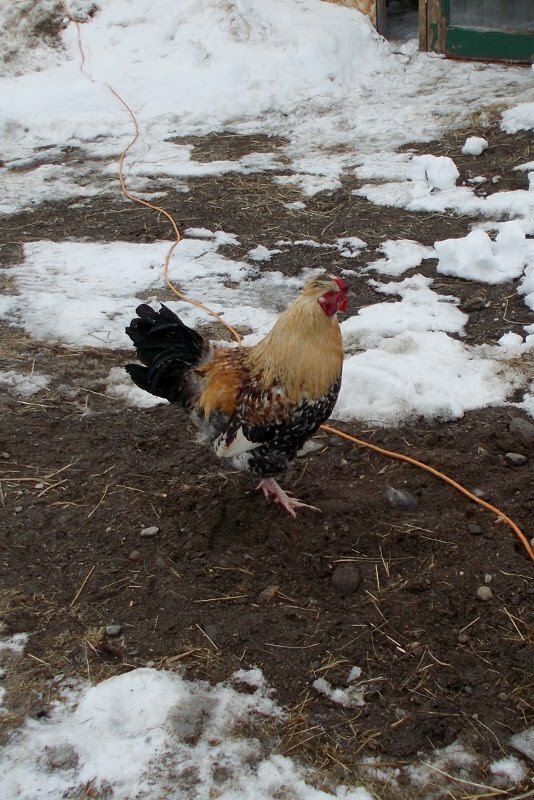 I think he was confused as to why the yard was empty of other chickens, but selttled into eating crumble. I opened the doors to release the others and divided out some oatmeal for breakfast. I think I caught Willie's grateful look. It's my story. I'm sticking to it. As I find I am still getting over this bug (whatever it is! ), I am finding that I have significantly less energy these days. I did get the farming chores finished and some of the household ones, too, before taking a little rest. We collected 6 eggs from the coop- one of which I am certain came from a cochin we hatched ourselves this summer! Exciting!! And, I discovered that a watched cheese-cloth full of farmers cheese curds never drains. I have been hopeful to have this batch of cheese ready by this afternoon. It looks like it is going to be evening before it drains sufficiently. I am anxious to taste this batch made with raw cow's milk from our local dairy farm just down the way. I have been missing home-made cheese since fall. I am anticipating it's deliciousness spread on bagel chips. YUM! I appreciate you all visiting with us today. Thanks for popping in. I hope you'll come again soon. This post also shared with our favorite blog hops. Check them out for more ideas on frugal living, sustainable living, recipes, DIY projects and more! Good luck with the cheese! Sounds like it will be delicious. It was sooooo good. One gallon of milk made 18 oz of soft farmers cheese. I mixed in some onion and chives. We're enjoying it on bagels in the mornings. I will be posting about it soon! I loved the photos of Willie doing chores with you. Looks like Willy had quite the adventure! 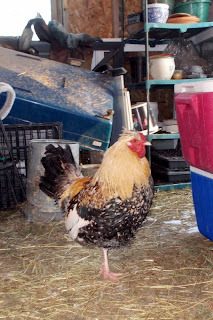 What an adventurous rooster :) Found you on Frugal Days and I would love to have you share this on The HomeAcre Hop! Thanks for sharing this on The HomeAcre Hop! So glad to have you join me :) Can't wait to see what you have to share next week! Love Willy! He is quite the looker - what a handsome guy! Found you on the HomeAcre Hop! Aww, that's so cute! 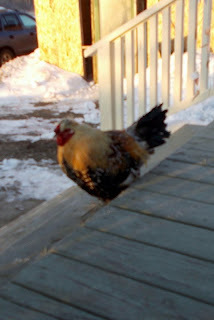 I love when my chickens follow me around the yard the way Willie followed you!